An infestation of red flour beetles in any stored products not only contaminates it, but also gives the product a foul smell and taste. They are attracted to flour with high moisture content. Adults can fly and are attracted to light. Besides consumption and contamination (e.g., feces, shed skins, body parts, secretions) of products, red flour beetles can cause infested products to be very disagreeable in smell and taste. 1/8 inch (3-4 millimeters) long. Adults measure 1/8 inch (3-4 millimeters) long; reddish brown. Antenna have an abrupt, three-segmented club. Warmer climates throughout the world. Grain products, especially milled grain products like flour. Females lay two to three clear white sticky eggs per day and can lay 300-500 eggs. Eggs hatch within five to 12 days, with larvae reaching maturity within 30 days in optimal conditions. Life cycle takes seven weeks in ideal conditions, but may take as long as three months or more. Heated facilities can have four to five generations per year. Red flour beetles can live two to three years. It’s difficult to control an established infestation of red flour beetles in a facility, especially if incoming shipments of infested ingredients are accepted by the facility. 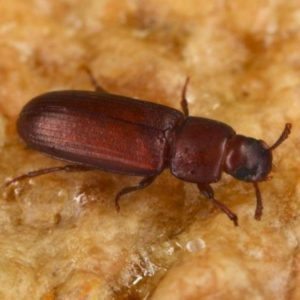 Also, the high reproductive capacity of flour beetles can result in very large infestations in a few months under suitable conditions. Copesan’s full-service pest management programs protect your food, health, people and brands . Click here to learn more.